So, without further ado, sit back and enjoy my Glasgow Coffee Festival preview. The Glasgow Coffee Festival is held in the Briggait, perhaps the most striking venue for a coffee festival (albeit a chilly one, which is why the festival moved from late autumn to spring last year). The Briggait was built as Glasgow’s fish market over 100 years ago, and consists of a single, soaring hall, with a vast, glass, arched ceiling, which gives the festival a great sense of light and space (something that’s lacking in other festivals). The festival is held on the floor of the main hall, but there’s a first-floor balcony that goes all the way around the building. Although there are no stands up there, you do get some great views of the festival floor. The festival’s organisers Glasgow’s Dear Green Coffee, make very good use of the space. Rather than cram in as much as they can they, the stands are arranged in four clusters, with eight stands per cluster and broad avenues between them, with plenty of space around the sides. Last year, there was a large seating area in the middle for those who want to take the weight off their feet and maybe eat some of the excellent food on offer. Of all the festivals I’ve been to, this is probably the best catered, with some outstanding local suppliers. There’s a limit on the numbers allowed into the hall, part of the reason that the festival has sold out every year. This also means that while the festival feels busy, it never really feels that crowded. The result is a laid-back and friendly event, with plenty of time to talk and socialise, and (for me at least) lots of opportunities to catch up with old friends and make some new ones. As I’ve said, this year the festival is going disposable-free. This means that you’ll be encouraged to bring your own cup with you, something I’ve been going on about for years. However, don’t worry if you don’t have your own cup, or if you forget it on the day. KeepCup will be loaning out cups for a £5 deposit and, if you get attached to it during the festival, for another £5, you get to take it home with you! Even better, there will be washing stations at the festival to help you keep your cup clean between coffees. So, what’s actually going on? Well, there’ll be the usual collection of stands, with a total of 40 exhibitors covering coffee roasters, cafes, equipment and various related (and sometimes non-related) lifestyle brands. Check out my three-part report from the 2017 festival to get an idea of who was there last year, while to see this year’s line-up, head over to the festival website. It’s worth noting that while this is billed as a celebration of Scottish coffee and coffee culture, there will be plenty who have ventured from further afield, including old friends Carvetii, from Cumbria, Casa Espresso, who are making the trip from Bradford, and Cast Iron Roasters, all the way from West Sussex (that’s even further than me!). 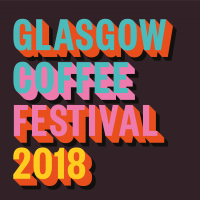 This year, as well as the usual selection of exhibitors, the Glasgow Coffee Festival will be hosting the finals of the UK Brewers Cup and a range of workshops, presentations and cuppings, all of which are included in the very reasonable ticket price of £14.50. It’s even better value if you go for the entire weekend, when a ticket will set you back just £22.50 (booking fees apply). So what are you waiting for? Get your tickets now! I (and my Therma Cup) will see you there! If you would like a copy of my book, The Philosophy of Coffee, I will have copies with me. I will also happily sign copies you have bought elsewhere if you want me to. If you liked this, don’t forget to check out the rest of Glasgow’s speciality coffee scene with the Coffee Spot Guide to Glasgow.